Episode 2 of TASTEABLE: California includes San Francisco's Pier 23's Golden Gate cocktail recipe, Author Michael Cervin's wine travel tips for Paso Robles, Half Moon Bay's Sam's Chowder House recipe for cod with pumpkin puree, a discovery of the latest in Absinthe by Raff Distillerie of Treasure Island, a tour of the Depot Cafe in Mill Valley, and Saratoga Chocolates' recipe for Caramelized Dark Chocolate Hazelnuts. "TASTEABLE: California" airs on KRCB public television (www.KRCB.org) in the San Francisco Bay Area on KRCB Public Television. KRCB broadcasts on Ch. 22 (722 HD), reaching over 2.5 million households in the San Francisco Bay Area from Napa and Sonoma, Santa Cruz, and San Francisco to Oakland, Livermore and Walnut Creek and beyond. Of course, it is much more refreshing with something sparkling in it. 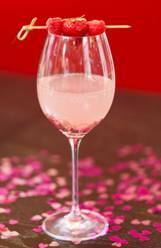 Combine VOGA Sparkling, strawberry liqueur, strawberry puree, lemon juice and sugar in a glass. Stir and garnish with mint. Their pop-up restaurant is called Forbidden Taste and its first pop-up was on May 30th, 2013 for only one evening. The guests are not invited automatically; first they need to write why it´s them who should be part of the next Forbidden Taste and whom they would take along. They say that Japan Inc. pays Western celebrities well for product endorsements, so making it big in Japan is a good way to go if you can get the work.